Stop the magician pirate BlackLore in this immersive adventure! Return to a world of magic and mystery in Magician's Handbook 2 Blacklore. 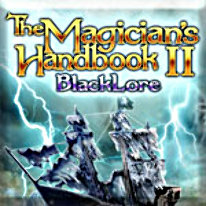 Use the enchanted Magician's Handbook as your guide in your search for the evil magician pirate BlackLore, who has captured all the world's magicians and fairies. Using their magic to fly his pirate ship, he's terrorized all who tried to get in his way...and you're next on his list! Adventure in magical lands from a spooky school for juvenile ghosts to an underground oasis full of talking trees, to a dark swamphouse where witches capture visitors and make them a part of their house! Can you stop BlackLore, or will you become his next victim? Over a thousand enchanted objects, magic spells, and a variety of unique and challenging puzzles await you in Magician's Handbook 2 Blacklore!